Sleep is one of the most important functions of the brain. In fact, depending on our age, we spend between a third and two thirds of our day sleeping. Although the science of sleep remains poorly understood, we know that lack of sleep can cause major health and cognitive problems. Anything that disrupts and disturbs our ability to sleep well is considered a sleep disorder. The easiest way to understand and classify sleep disorders is by dividing them into two categories. The first category consists of problems with the brain itself, either making us sleep too much or preventing us from sleeping enough. The second category consists of problems with the rest of the body that interferes with our sleep. There is a system in the brain called the sleep center, that controls and regulates our sleep-wake cycle, makes us sleepy at night and helps us wake up in the morning. The sleep center is influenced by light and darkness and adjusts our sleep-wake cycle to the night-day cycle, even if we move to a new location. Our sleep system changes over the years as we age and our requirements for sleep change. The system works overall well, but is somewhat fragile and can be influenced by various physical and psychological factors. Certain brain disorders affect the sleep system in the brain in different ways and results in different sleep disorders. Narcolepsy is a sleep disorders characterized primarily by excessive sleepiness. Patients are typically tired and sleepy throughout the day and have a strong tendency to fall asleep. Sometimes, the urge to fall asleep is so strong, that patients are unable to fight it. This is called a sleep attack. Narcolepsy is a disorder that affects a very important stage of sleep, called Rapid Eye Movement (REM) sleep. REM is the stage of sleep during which we dream. Our muscles became paralyzed to prevent us from acting out our dreams. Patients with Narcolepsy have an abnormally strong tendency to go into REM sleep. Normally, after we fall asleep, it takes about 90 minutes before we go into REM sleep. Patients with Narcolepsy go into REM sleep much sooner, sometimes as soon as they fall asleep. In fact, sometimes they go into REM sleep before even falling asleep. In this case, patients experience visual hallucinations because they start dreaming while they are still awake. This is called REM intrusions. Typically, patients with Narcolepsy experience REM intrusions when they are in bed ready to fall asleep, or when they wake up. In addition, patients may feel their bodies paralyzed as they start to fall asleep or as they wake up. This is called sleep paralysis. REM intrusions and sleep paralysis frequently occur at the same time which makes the experience fairly scary. In addition, some patients with narcolepsy also experience a symptom called cataplexy. Cataplex consists of sudden loss of muscle tone that happens when the patient has an emotional reaction, such as laughter or surprise. Cataplexy is frequently mild and affects either the neck or knees. Patients will feel their head drop slightly or their knees buckle when they hear a funny joke. However, in some patients, cataplexy is so severe that patients collapse on the floor. Narcolepsy is diagnosed with a sleep study followed by a "nap test" or multiple sleep latency test (MSLT). Several medications are available to treat Narcolepsy, including medications that help patients stay awake, and medications that prevent the brain from going into REM sleep. In addition, some behavioral modifications are frequently helpful. For example, some patients have one or more brief naps during the day, which helps them function better at work. Overall, most patients with Narcolepsy respond well to treatment and lead fairly normal lives. Parasomnias are a group of sleep disorders that typically start in childhood and include three types: Sleep walking, Night Terrors and Confusional Arousals. All three types have many similarities and may occur in the same patient. Parasomnias occur during the deep stage of sleep called Delta Sleep. Patients appear awake but have no recallection of the episode. Parents describe their children as having "glassy eyes". Many children who develop night terrors during early childhood, start having sleep walking and confusional arousals as they grow up. In general, parasomnias are not dangerous and do not require treatment, unless they occur very frequently and cause danger to children. For example, during an episode of sleep walking, a child might leave the house and walk in the middle of a road. Ensuring a safe environment at home is probably the most important part of treatment. Several medications are available to treat parasomnias, however, as mentioned earlier, most children do not require treatment. Parasomnias tend to stop as patients get older but may persist into adulthood in some. Rapid Eye Movement sleep (REM) is an important stage of sleep during which we dream. Several changes occur in the body during REM sleep. Heart beat and breathing become irregular, the eyes move rapidly in all different directions and muscles become paralyzed. The reason muscles become paralyzed is to prevent us for acting out our dreams. REM Behavior Disorder (RBD) is a neurological disorder in which muscles do not become fully paralyzed during REM sleep. As a result, when patients start dreaming, they tend to move their bodies in a violent manner as if they are acting out their dreams. Patients are not aware of what they are doing and bed partners usually report the symptoms. In some cases, the movements because so active that patients fall off the bed. Patients may remember their dreams, especially if their movements wake them up from sleep. Some patients with RBD develop Parkinson's disease, a neurological condition characterized by slow movements and tremors. RBD is usually treated with medications that decrease the amount or eliminate REM sleep completely. Insomnia, commonly known as sleeplessness, refers to difficulty falling asleep or staying asleep. Some people have trouble falling asleep. They stay up late tossing and turning in bed and typically say that their thoughts are racing and they are unable to "shot down their brain". Other people have no trouble falling asleep, but wake up in the middle of the night, either once or several times, and have trouble falling back asleep. Finally, some people have no trouble falling asleep or staying asleep, but wake up very early in the morning, before they are done sleeping, and cannot go back to sleep. These different types of insomnia usually have different causes. Insomnia is a very complicated condition and may be caused by several medical or psychological illnesses. Treatment should always include a behavioral component, including following proper sleep hygiene and habits, in addition to cognitive and behavioral therapy. Medications, such as sleeping pills, can be used, but should only be used for short periods of time to avoid dependence. Sometimes, the sleep center in the brain are functioning normally, but problems outside the brain, affecting other organs in the body, interfere with the sleep center and affect our ability to fall asleep, stay asleep or be awake during the day. Several conditions may affect sleep, including conditions that cause pain, involuntary movements and breathing difficulties. The respiratory airways consist of all the tubes that connect the nose and mouth to the lungs. Normally, airways need to remain open during sleep so that we continue to breath normally. When the airways become narrow, air cannot move freely anymore and produces a loud noise or snoring. In addition, the person will start exerting more effort to breath and frequently wakes up before the airways are open again. When airways get blocked completely, this causes an apnea, or inability to breath. 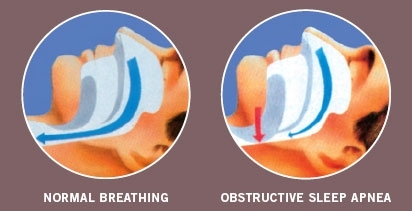 Obstructive Sleep Apnea (OSA) is a medical condition characterized by a tendency of the airways to become narrow and get blocked during sleep. Patients with sleep apnea usually snore loudly and have apneas during sleep. Patients are usually very sleepy during the day because they wake up frequently at night, although they frequently are not aware of it. Bed partners usually report loud snoring and apneas. During a sleep study, we often find that the brain wakes up very frequently, sometimes for only a few seconds at a time. This is enough to deprive the brain of the needed rest and cause sleepiness during the day, even difficulty with memory and concentration. In children, sleep apnea can present differently. Children often become hyperactive when they get tired. This is seen in pediatric sleep apnea. Sleep deprivation over several weeks and months causes attention deficit and hyperactivity, resulting in decline in school performance. It is very important to consider sleep apnea in any child presenting with hyperactivity and inattention, before offering treatment with ADHD medications. Continuous Positive Air Pressure (CPAP) is the most effective treatment for sleep apnea in adults. However, it is rarely used in children. Most children presenting with sleep apnea have enlarged tonsils and the treatment of choice is surgical removal of the tonsils, or tonsilectomy. Other treatment options including weight loss in overweight patients, an oral appliance that keeps the airways open and surgery. Surgery can be an effective option in certain patients, but is not for everybody. Periodic limb movements in sleep (PLMS) is another sleep disorder where the sleep centers are working properly, but repetitive movements of the legs wake the patient up causing chronic sleep deprivation. PLMS most often affect the legs, but sometimes affect the arms. Like other sleep disorders, patients are usually unaware of their movements. Bed partners usually report the symptoms. Patients frequently have very frequent brief arousals that they are unaware of. PLMS is sometimes associated with another condition called Restless Legs Syndrome (RLS). Not everybody with RLS develops PLMS and not everybody with PLMS has RLS. RLS causes a sensation of discomfort in the legs, usually occurring in the evening when the person is sitting or lying down. Moving the leg causes relief and patients frequently move their legs repeatedly. There are several medications that treat both RLS and PLMS, however, it is important to note that patients with sleep apnea sometimes also have PLMS and when the sleep apnea is treated, PLMS improve.